If ever he used his brother’s name or family connection, it was for the benefit of Sri Lanka Telecom (SLT) and never for personal gain, SLT Chairman P.G. Kumarasinghe Sirisena, younger brother of President Maithripala Sirisena, said this week. Mr. Sirisena said SLT had secured contracts from institutions such as the Road Development Authority (RDA), the Megapolis Ministry and the Telecommunications and Digital Infrastructure Ministry. He had wide networks in the State sector — something he banked on for the good of SLT and the country. Mr. Sirisena said he has borne the brunt of many attacks on his integrity over the past few months, carried out chiefly via web articles. He insists they were the “vengeful fabrications” of a group of “maximum five people” who had ulterior motives. He did not disclose what those motives were. Most recently, Mr. Sirisena is alleged to have sought a US$ 5,000 (nearly Rs. 728,000) monthly allowance to rent a house in Colombo. He said that, while the possibility of renting a house in Colombo for him had been discussed at a recent Board meeting, a figure had never been mentioned. It was also alleged that, last year, Mr Sirisena had proposed a threefold increase in his monthly remuneration — bringing the figure to at least Rs. 1 million. He admitted that a recommendation had gone up from his office to the Board of Directors to raise the allowances paid, not just to him, but to all directors. He said he had proposed three options — increases of 50%, 60% and 70% — that would apply to all the directors. Today, however, he draws the same allowance that was set in 2006 and “not a red cent more”. He declined to say how much, citing a non-disclosure rule. He also said he is not paid an allowance from Mobitel, of which he is also chairman. Meanwhile, Mr. Sirisena said a committee of three ministry secretaries was studying an SLT bid to buy Hutch Telecom, a private mobile service provider which he said had a “very clean spectrum”. Talk of a deal first came up in 2013 when Mahinda Rajapaksa was President but was called off amidst allegations of inflated pricing. 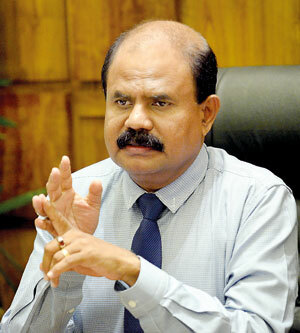 Mr. Sirisena said SLT needed Hutch because its own spectrum was now overcrowded. “When the proposal (to acquire Hutch) came up this time, I said clearly that it must be put to Cabinet to ensure that old problems don’t arise again,” he said. He added he did not hold any negotiations with Hutch but appointed a team, which includes the Chief Executive Officer of SLT, for the purpose. Their proposal first went to the Economic Sub Committee which referred it to a group of three secretaries for a valuation. “Valuations of this nature are usually done by top notch international auditors,” the Chairman said. “An auditor has been entrusted with the task. Once it is completed and a price is determined, we will pay it and buy Hutch.” No price has yet been decided. Mr. Sirisena said he had blocked the attempt of a British mobile network, which he did not want named, to buy Hutch. “Not only that, they wanted to start another network in Sri Lanka,” he said. Both possibilities would have hit the national operator badly so, “I put my life on the line to ensure it wouldn’t happen”. He now had two goals, Mr. Sirisena said. One was to see his son become an engineer. The other was to make SLT the number one revenue earner for the Government. He recently introduced concession packages for Samurdhi beneficiaries and public officials, including those employed in rural administration. Certain other packages were made available to semi-government and private sector employees, senior citizens and university students. With the aim of increasing internet penetration, SLT is now providing smart phones on easy payment terms. As the National Backbone Network, steps are being taken to provide high speed internet to all parts of the country. The fibre optic network was being enhanced through the “i-Sri Lanka project”. The foundation stone has been laid for a national data centre in Homagama. A technology campus has been set up in Padukka for students who are unable to enter national universities, and a scholarship scheme introduced. The chairman said the company expects to go for a public offering within the year in compliance with a Colombo Stock Exchange rule. “I have proposed to the Board that we do it,” he said. Both the Government, which now has a 49.5% stake in SLT, and Malaysia’s Maxis group, which has a 44.98% stake, will each have to offer up to ten percent to the public.